An art sculpture that you may have seen displayed at a couple of different Metro Transit locations over the years now has a new home in Ferguson at the North County Transit Center. 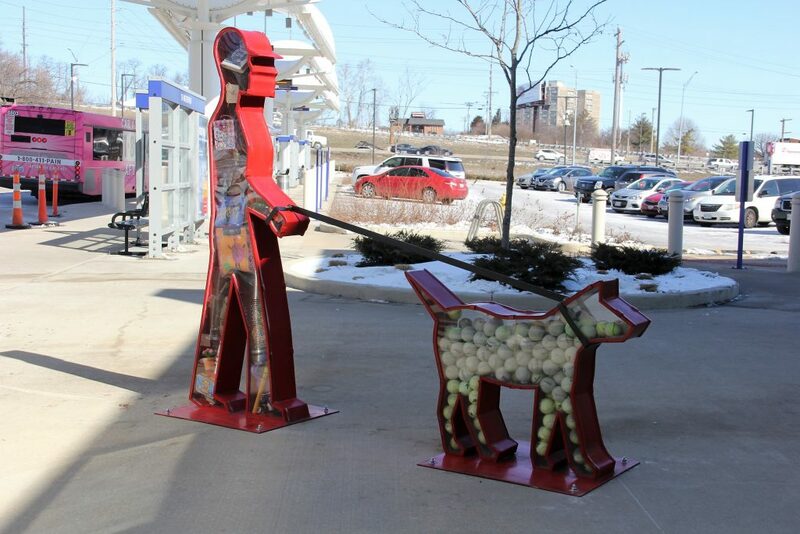 The “I Want” Arts In Transit sculpture, which showcases a person walking a dog with various consumer goods inside, was recently moved from the Maplewood-Manchester Transit Center to the North County Transit Center. The artwork was created by Chicago artist Victoria Fuller and commissioned into the Arts In Transit program in 2001. At that time, the artwork was temporarily installed on Delmar Boulevard near The Pageant. About seven years ago, the sculpture was officially integrated into the Metro Transit system and relocated to the Maplewood-Manchester Transit Center. The artwork was initially installed in the plaza area north of Manchester Road before being moved a short time later to the south side of Manchester Road. Extreme weather conditions over the years took a toll on the sculpture. While the artwork has been restored several times since it was commissioned, its location at the Maplewood-Manchester Transit Center wasn’t the best fit. The better fit turned out to be the North County Transit Center, which opened in March 2016. In addition to the sculpture, the transit center also features an art gallery inside that showcases local artists year round. There are nearly 40 Metro Arts In Transit artworks installed across the transit system that were created by artists not only from the bi-state area but from other cities in the United States and Canada. Several of the artists have received global attention. Arts in Transit was established in 1986 to connect the community and public transit through art and art education. Since then, it has supported numerous public art programs throughout the St. Louis region.